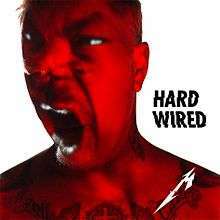 "Hardwired" is a song by heavy metal band Metallica, and the first single from their tenth studio album, Hardwired... to Self-Destruct. The song was released to the radio and for digital download on August 18, 2016. The song was first played live at the end of the band's show at U.S. Bank Stadium in Minneapolis on August 20, 2016. The band detailed on the song's debut at The Howard Stern Show that it was a late addition to the album, as Lars Ulrich explained that after finishing the other songs "we decided that we needed a short, fast opener", leading him and James Hetfield to compose "Hardwired" in about a week. ↑ "Metallica "Hardwired" Live on the Howard Stern Show". The Howard Stern Show. September 2016. Retrieved October 2, 2016. ↑ "ČNS IFPI" (in Czech). Hitparáda – Digital Top 100 Oficiální. IFPI Czech Republic. Note: insert 201647 into search. Retrieved November 30, 2016. ↑ "Archive Chart: 2016-08-26". Scottish Singles Top 40. Retrieved August 27, 2016. ↑ "SNS IFPI" (in Slovak). Hitparáda – Singles Digital Top 100 Oficiálna. IFPI Czech Republic. Note: insert 201647 into search. Retrieved November 30, 2016. ↑ "Metallica – Chart history" Billboard Bubbling Under Hot 100 for Metallica. Retrieved August 30, 2016. ↑ "Metallica – Chart history" Billboard Hot Rock Songs for Metallica. Retrieved September 2, 2016. ↑ "Metallica – Chart history" Billboard Mainstream Rock Songs for Metallica. Retrieved September 27, 2016.